At the Mayo Clinic in Minnesota, doctors have been studying the results of yoga practice on stress levels for years. The Happy Result: yoga works! weight gain -- probably due to eating comfort food! With its quiet, precise movements, yogic practice draws your mind away from your busy, chaotic day. Breathing also demands extra attention in this healthy living exercise. 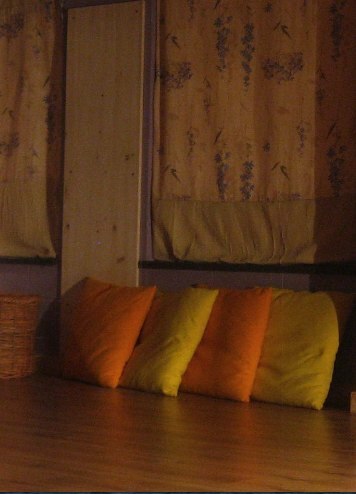 Would you like to look around a yoga studio? A click on photo above will lead you to Eileen's studio in Abbotsford, British Columbia. In this practice, breath signifies your vital energy. You learn to control your breathing...which in turn helps you control your body and gain control of your mind. ... In fact, try filling your lungs right now. I know you're sitting, so it won't be a full breath, but inhale deeply, let your belly expand, and drop your shoulders back as you release that breath. Feel that? We often take our breathing for granted and breathe shallowly. Yoga challenges that. To see such breathing demonstrated, as well as the "corpse pose" and "mountain pose" view this 4 1/2 minute video from New Zealand. this link takes you to that page on this site. ...and when combined with a vegetarian diet, aerobic exercise and medication, yoga has reduced cardiovascular disease rates and blood pressure levels. Specific concerns for aging adults respond to this practice. Those coping with cancer--and their caregivers--find that they have an improved quality of life, and sleep better at night! Balance improves, helping older adults stay steady on their feet and avoid falls and hip fractures. Alzheimer's caregivers find that this practice boosts their mood, increasing their ability to cope with the stress and fatigue inherent in their situation. Return from Yoga Benefits to Healthy Aging.